Well Here we are in 2019. Happy New Year to you all. 2018 was full of surprises. I broke my foot in July 2018. Carried on working with hubby and daughter giving me lifts. It was hard but I managed. Foot ok now – but still not 100% . but all good. Had a great Summer working mainly at Kent Life in Sandling Maidstone Kent. and I also did some after Christmas shows there too. It was great fun meeting you all. Dizzy Lolly my daughter is well, and working very hard. Thank you everyone through 2018 for booking us for their parties. We look forward to seeing lots of you again this year. Mini Digger Parties are going very well. – We would love to come to one of your parties with our Digger. It’s such a Unique Party – your child will never forget. 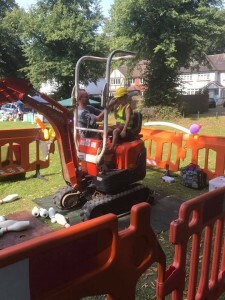 We are looking into venues that will hold a Digger Party with outside facilities. When we have a list of Venues we will post, s it’s not always convenient to hold a party in your garden.